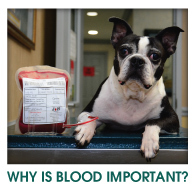 Why is Blood Important to Emergency Animal Hospital? Home • Blood Bank • Why is Blood Important? The donation process starts with lots of love, praise and treats. Our goal is to have our hero dogs as comfortable as possible for the donation process. They will either lie on their side or sit on the floor for their donation. A patch of hair over the jugular vein is then shaved and the skin is cleaned with a surgical scrub. A technician then inserts a needle into the jugular vein to collect approximately 450ml of blood. This only accounts for a small percentage of your pets blood supply. The entire process takes about 10-15 minutes and is virtually pain free. Cats are less cooperative when sharing their blood and sedation is required for feline donations. What happens to the blood after collection? Once the blood is collected, it is then separated into components. This allows a single donation to benefit multiple pets in need. The donation is spun in a special refrigerated centrifuge to separate the red blood cells from the plasma. 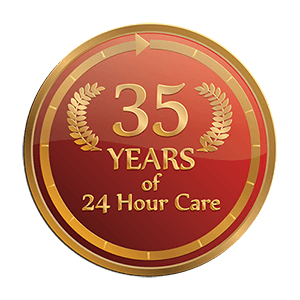 Fresh frozen plasma is kept frozen for 1 year, while packed red blood cells can only be stored for a maximum of 42 days in the refrigerator when the proper preservative is utilized. Feline packed red blood cells can be stored for 30 days refrigerated. Pets have different blood types just like humans do. Cats have 3 different blood groups represented by A, B and AB. 90-95% of cats in North America are represented by type A with B being rare (about 5%) and AB representing about 1% of the cat population. 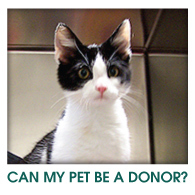 Cats have no universal donor like dogs and people. It is vital to blood type the recipient as a mismatch can cause transfusion reactions. There are 8 major blood groups for dogs, although experts believe there can be many more than that. Dogs are represented by the DEA group (Dog Erythrocyte Antigen) and are numbered accordingly. Only DEA types 1, 4, 5 and 7 can be currently tested for. Dogs that are 4 positive only are considered universal donors as 98% of the canine population is positive for this blood type. It is possible for one dog to test positive for more than one blood group, making typing and cross-matching important to ensure safe transfusion practices. Jefferson Animal Hospital tests for DEA 1 in canines receiving transfusions. This allows us to better utilize our donor pool by saving our universal donors for those that truly need it by giving DEA 1 positive blood to the dogs of the same type. This helps reduce demand for universal donors which, at times, accounts for blood shortages.